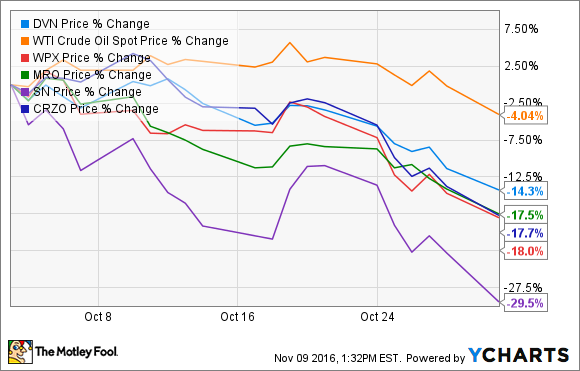 Devon Energy, WPX Energy, Marathon Oil, Sanchez Energy, and Carrizo Oil & Gas were all down by double digits due to many of the same catalysts. Crude slipped last month due to concerns that OPEC might not follow through on an agreement to cap and cut output. That is after Iraq reportedly wanted an exemption that would allow it to maintain its current production level instead of participating in a cut. That followed reports that Iran, Nigeria, and Libya also wanted an exemption from the OPEC deal. Those concerns weighed on oil stocks because producers need a more stable oil price environment to give them the confidence to make investments. In addition to those fears, mergers and acquisitions played a prominent role in driving oil stocks lower because producers have been positioning themselves for an improving oil market, which might not come as quickly as anticipated. For example, Carrizo Oil & Gas reached a deal with Sanchez Energy to buy some of its Eagle Ford shale properties for $181 million. While that deal boosted Carrizo's core position in the play by 15%, the company needed to issue equity to fund the transaction, which the market did not like. Meanwhile, fueling Sanchez Energy's plunge was a market rumor that the company was looking to team up with a private equity fund to purchase Anadarko Petroleum's (NYSE:APC) south Texas oil and gas assets. The rumored deal could be worth as much as $3.5 billion, which is substantial considering that Sanchez Energy's enterprise value is less than $2 billion. While it will soon receive cash from Carrizo Oil & Gas, investors fret that the company might be getting in over its head. Marathon Oil and Devon Energy also had M&A news during the month. In Marathon's case, it sold $235 million of non-operated carbon dioxide and waterflood assets in Texas and New Mexico. Meanwhile, Devon Energy completed the $1.1 billion sale of its Access Pipeline in Canada, which marked the end of its $3.2 billion asset divestiture program. That said, those sales were mainly positives for the companies because it added cash to their balance sheet, which gives them flexibility for debt reduction or to ramp up capex spending. The only other news is that Barclays downgraded Marathon's stock, cutting it from overweight to equal weight while trimming the price target from $18 to $17. Outside of that, the primary reason both stocks sold off last month was due to the OPEC-induced oil market jitters. Finally, WPX Energy's October sell-off was, likewise, purely related to oil prices. In fact, the company did not have any related news during the month to weigh it down, and analysts showered it with praise. FBR Capital, for example, initiated it at outperform and awarded it a $16 price target. Meanwhile, Evercore ISI upgraded the stock from hold to buy and raised the price target from $14 to $16 citing upside from its Delaware Basin assets. Finally, Barclays upgraded WPX Energy from underweight to equal weight and raised the price target from $13 to $19 due to its growth potential. Concerns surrounding the OPEC agreement started to stress out the oil market in October. That is because the deal would help put a floor under prices, giving producers the confidence to invest in their future. That said, the uncertainty has not stopped oil companies from wheeling and dealing over the past few months, with all five companies completing material acquisitions and asset sales as they position themselves for what they hope is an impending rebound in the market.